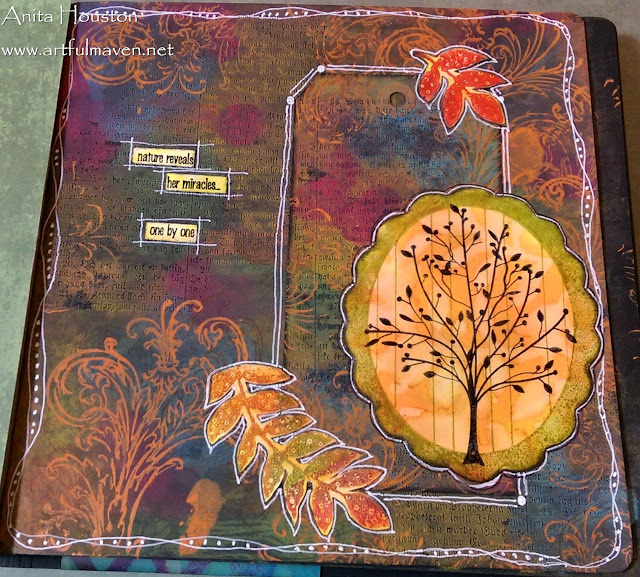 Autumn is in the air at the Make Art Wendy Vecchi Challenge for this month. The challenge is to Celebrate Fall, and you have about five more days to join in! 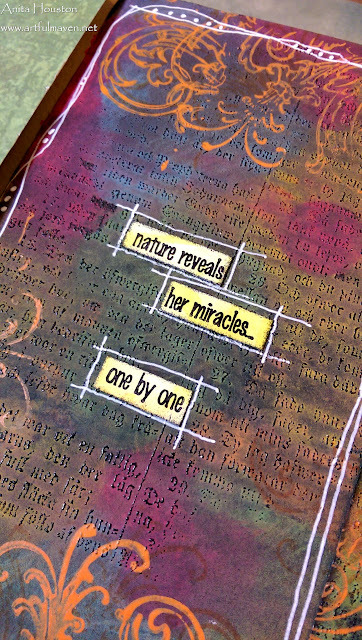 This is one of the items I created at the retreat...the only non-Christmas item too, and I finally had a chance to break out my new Dyan Reaveley Dylusions Creative Journal in Black. DON'T BE AFRAID of using the black...it's fun!!! Kim inspired me to use it, as she created her inspiration piece for the challenge using it too. Thank you Kim! 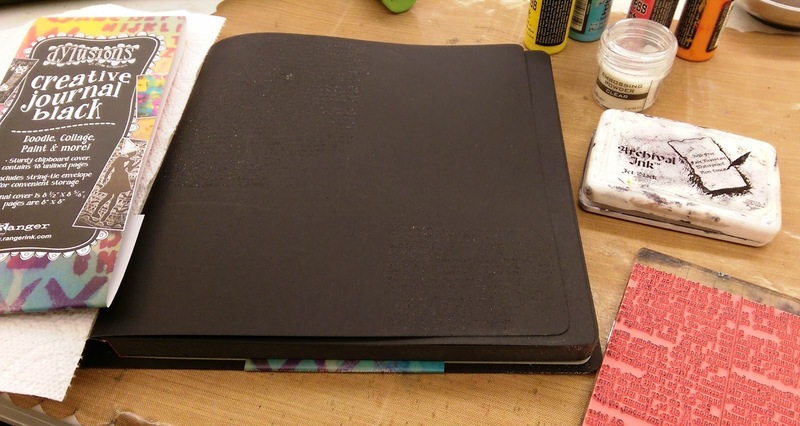 I stamped Wendy's new Vintage Text stamp in Ranger's Jet Black Archival onto the journal, and then sprinkled Clear Embossing Powder on it, and heated it up. I did the same to a black tag. 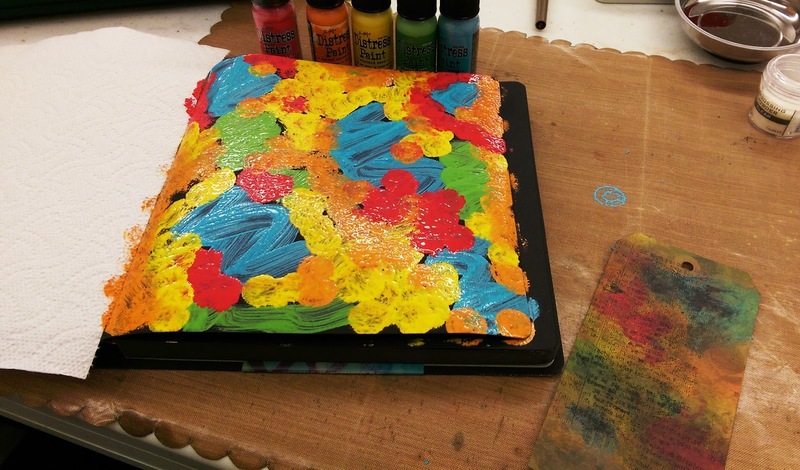 I added several colors of Tim's Distress Paints onto the page and tag, in random splotches. 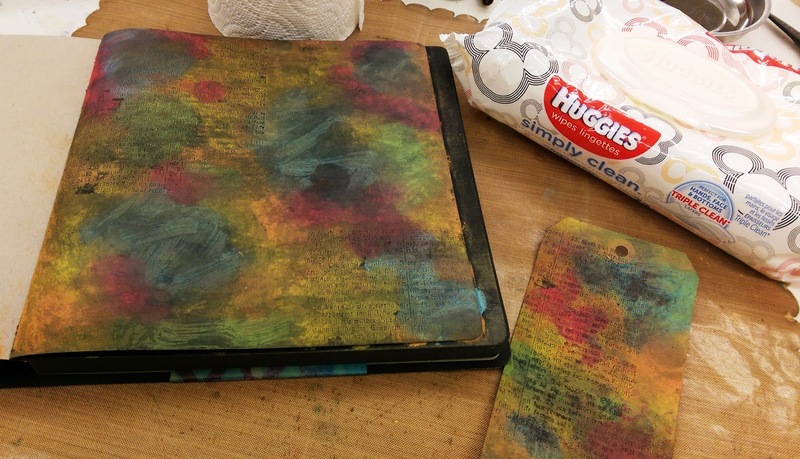 I let this dry about five minutes. 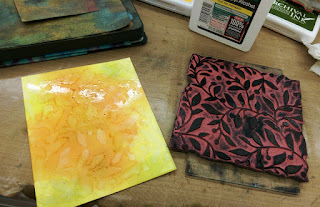 I used a baby wipe to clean the paint from the embossing and it softened the colors. LOVE!!! 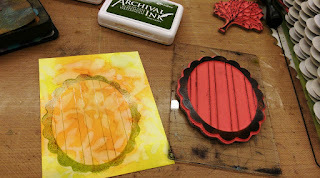 I inked the edges of the tag and page in Jet Black Archival, and then stamped Tim's Flourish in Spiced Marmalade. I know I use the word 'favorite' a lot, but this stamp really probably is my favorite. It's so versatile and looks good on everything. 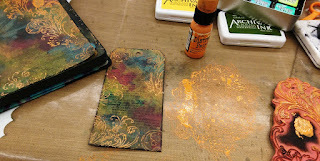 Last week, Wendy wowed me with a tutorial stamping in rubbing alcohol...check it out...and I had to do that too! The lady is a mastermind of technique I tell you! I inked a piece of Distress Stamping Paper with Wendy's Archival Ink, and dried it. The nice thing about using this paper is that the ink stays wet longer and you can blend the colors. COOL! 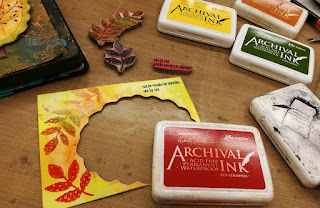 Even though this stamp looks dirty, I cleaned it first with alcohol to make sure it was free from any ink that would come off before stamping. I sprayed alcohol on the craft sheet and tamped my stamp...I like that term, tamped my stamp....and pressed the image onto the paper. COOL huh?!! Then I dried. 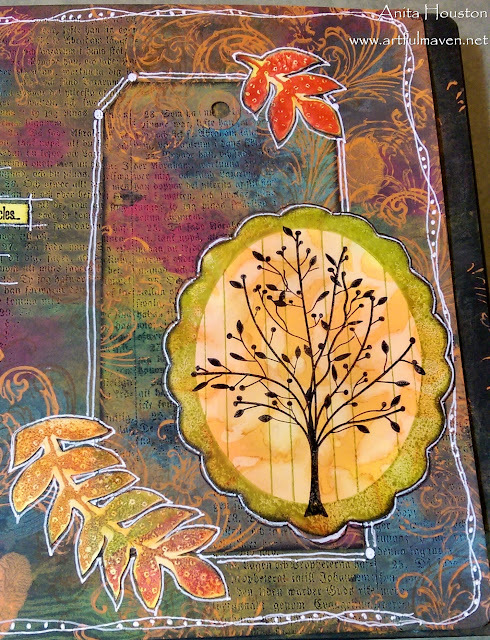 I stamped Wendy's Frame in Fern Green, dried this, then cut it out, and inked the edges. 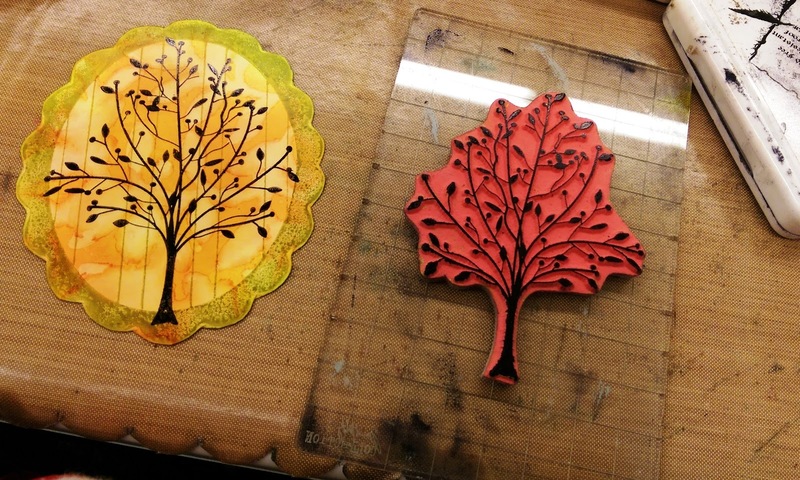 I stamped the tree in Jet Black, and dried. 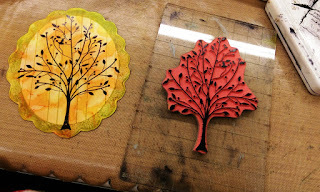 With the scrap, I stamped some of Wendy's leaves and a sentiment using a few different colors of Archival. 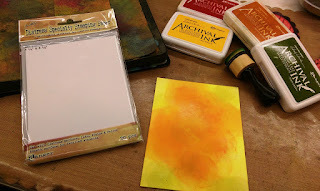 I really should have used the new Custom Ink Pad for Archival, as it would have been easier, but I don't have one yet...new shopping list going! 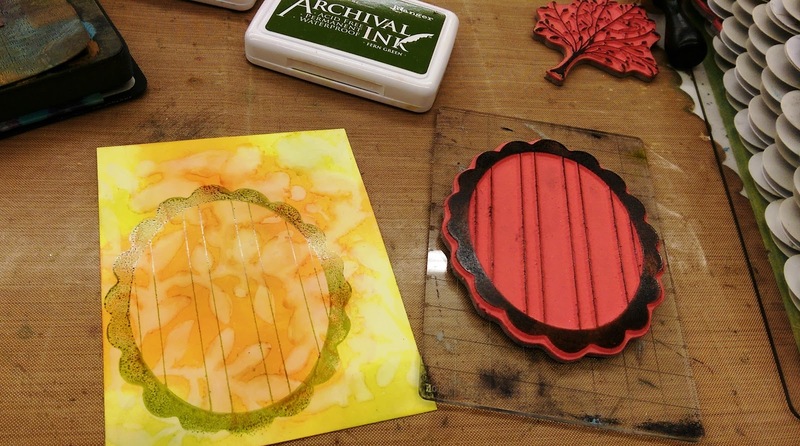 I then dried, cut then out, and adhered everything to the page. Then I used a white and black gel pen to outline some things. I hope you join in, and if you do, you have a chance to win a fabulous prize. Ah Fall! So many rich colors and textures. Great techniques. 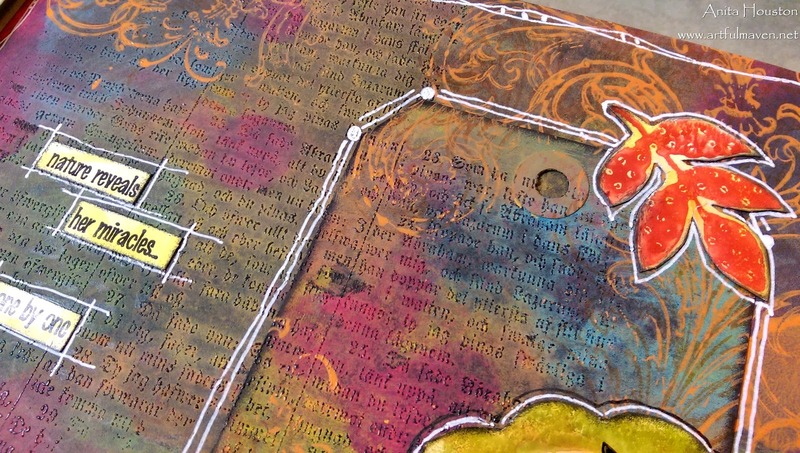 I especially love how the background of the embossing and paint turned out. 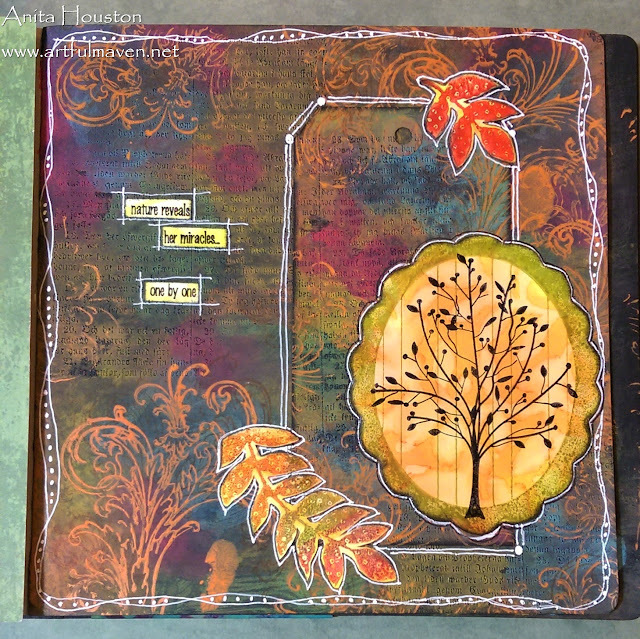 and now you have totally inspired me to try out my journal which i have had for ever it seems but not quite sure what my 'first' should be.. i love this page Anita!!! i can't wait to play! The effect that you got on that background is amazing, I love this Anita, so amazing!!!! How gorgeous, Anita! Those colours look amazing against the black page, and I love your little alcoholic tree panel. So many ideas and techniques... fab! Such great depth of color! This is gorgeous and I am happy to find out about the WV challenge. TFS! Thanks for playing along, Anita! Love your page...the background is dreamy! Christmas In A Mason Jar?? ?